Savenor’s is long been my go to place for extremely expensive, but high quality meats. 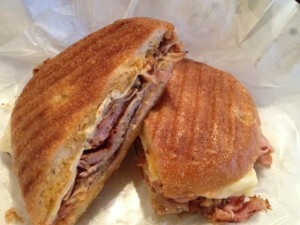 They added a sandwich counter in May and I was excited to try the Havana, their version of a Cuban. It is described as: House-Roasted ABF Pork Shoulder, Rovagnati Gran Biscotto Ham, Swiss Cheese, Sliced Grillo’s Dill Pickles, House Pickled Red Onion, and Spicy Aioli on an Iggy’s Torta Roll with a brush of Mustard Butter. The meats were flavorful, although I thought the spicy aioli overwhelmed the sandwich. The torta roll is just wrong (baguette is the traditional choice). I enjoyed it, but I wasn’t wowed by it. $11 is a hefty price tag for a sandwich that I’m eating out of a brown bag (no tables), especially when the other sandwiches all range for $7-$9. I think the Cuban at Oriental de Cuba for $9 is far superior, and Gustazo at $9.50 is a better value as it comes with plantain chips and table service.